An appeals court ruled Tuesday that a 20-year ban on new uranium mining along the Grand Canyon will remain. The ban was first introduced by the Department of Interior in 2012 under former President Barack Obama and then-Interior Secretary Ken Salazar. 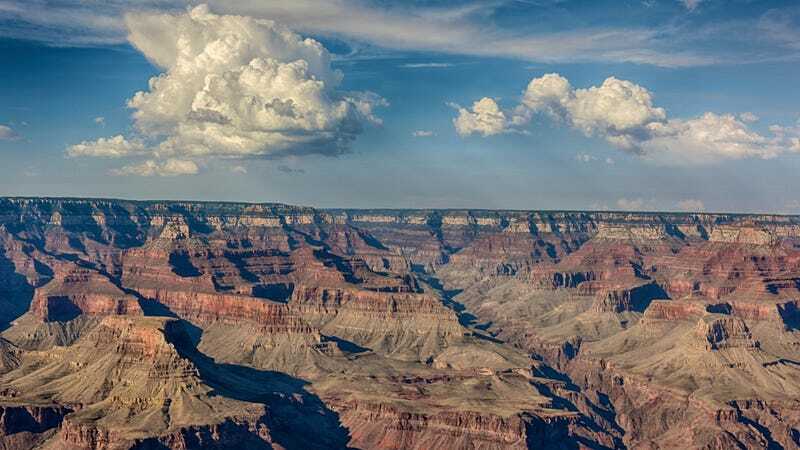 It placed protections upon more than one million acres of land surrounding the Grand Canyon and waters that, if contaminated, would flow right into the canyon. The idea of the 20-year ban was that it would give scientists and researchers enough time to understand exactly how uranium mining can impact the environment and, in turn, the people who live there, including the Havasupai Tribe. The National Mining Association sued the Department of the Interior on its ban in 2012, and the tribe intervened back in 2013, so this ruling is some pretty good news for them. The mining companies could seek a rehearing on this case, but these petitions aren’t often granted, according to the Center for Biological Diversity. But the court also appears to side with the federal government when in doubt, program director Roger Clark of the Grand Canyon Trust, told Earther. That turned out well with this case but not with another in which the Havasupai were involved and that the same court ruled on Tuesday. The court rejected the Havasupai’s request for Energy Fuels Inc., the company behind Canyon Mine, a uranium mine on the Grand Canyon’s south rim, to formally consult with the tribe before mining. So siding with the federal government can mean a loss, too, especially under President Donald Trump, who doesn’t seem that interested in protecting bodies of water or lands of cultural and historical significance (Ahem, Bears Ears). In fact, the Trump administration has been much more interested in exploring public lands for development. In October, the U.S. Fish Service recommended opening up lands in the Grand Canyon watershed to uranium mining. Tuesday’s ruling won’t stop the current administration from going ahead with that, if they so please. “The same law that gives former Secretary Salazar the authority to order the ban gives current Secretary [Ryan] Zinke the authority to rescind it,” Clark said. Still, let’s bask in this win while we can. The Grand Canyon is safe from uranium mining—for now. And the ruling sets a good precedent, too, Clark said, but his team remains on its toes, nonetheless. “We’re very concerned at the ongoing risk to groundwater, surface water, wildlife, the Havasupai people, and our economy, which is based on tourism,” Clark said.